inches (36 to 40 centimeters) long, with tail streamers that are a length of up to 25.6 inches (65 centimeters). They weigh between 6.3 and 7.4 ounces (180 and 210 grams). Geographic range: Resplendent quetzals are found in areas of Central America, from southern Mexico to western Panama. 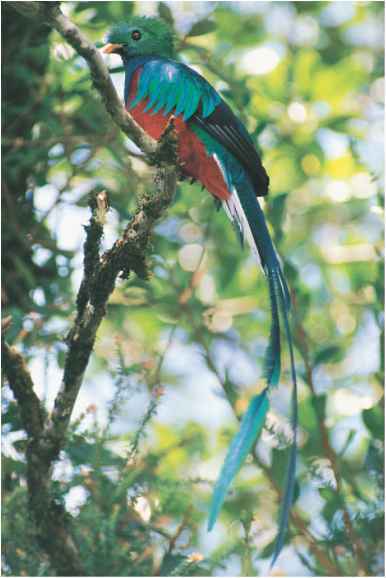 Habitat: Resplendent quetzals occur in forests and along forest edges, mostly in the canopy and sub-canopy (below the treetops), but can be found in lower areas. Specifically, they are found in mountainous evergreen forests, densely vegetated ravines and cliffs, park-like clearing and pastures, and open areas with scattered trees next to forests. Diet: Resplendent quetzals eat fruit, insects, small reptiles (such as lizards), and amphibians (such as frogs). Behavior and reproduction: Resplendent quetzals are territorial by nature. They nest in a deep, unlined cavity with one entrance. The nest is usually 14 to 90 feet (4.3 to 27 meters) off the ground in a rotting trunk or stump in the forest or in a nearby clearing. During the breeding season, which lasts from March to June, male resplendent quetzals show off to females with flying displays. 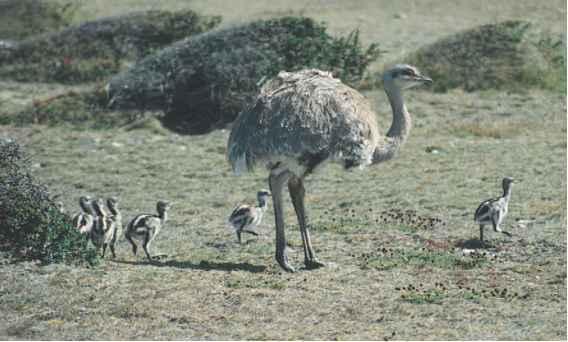 Females lay one to two eggs, incubate them for seventeen to nineteen days, and then fledge them (raise them until they can fly) for twenty-three to thirty-one days. Resplendent quetzals and people: The ancient Maya and Aztec cultures of Central America have long honored resplendent quetzals. Their plumes were used for decoration well into the twentieth century. Their colorful plumage is very popular with birdwatchers. del Hoyo, Josep, A. Elliott, J. Sargatal, et al., eds. Handbook of the Birds of the World. Barcelona: Lynx Edicions, 1992. Elphick, Chris, John B. Dunning, Jr., and David Allen Sibley, eds. The Sibley Guide to Bird Life and Behavior. New York: Alfred A. Knopf, 2001. Stattersfield, Allison J., and David R. Capper, eds. Threatened Birds of the World: The Official Source for Birds on the IUCN Red List. Cambridge, U.K.: BirdLife International, 2000.